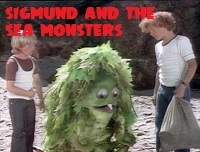 In a very nice turn of events, our son completely loved the final episode of this story. He was especially impressed with the destruction of the Cybermen’s ship. Afterward, he told us “that’s the biggest bang I ever saw in the whole history of Doctor Who!” He loved that so much that – for now – he’s actually claiming this is his very favorite story that he’s seen. Come on, nobody thinks that! Although, honestly, it’s better than I remembered. It has a good script, and I love how David Collings plays Vorus at maximum volume, absolutely furious in every scene he’s in. It’s still flawed in the execution in a few places, of course. 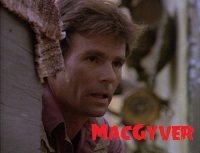 There’s a particularly weird – and phony, but mainly weird – special effect when they nearly crash into the planet, and if I’ve been picking on MacGyver for all it’s repurposed film footage, then the use of an Apollo rocket launch to substitute for the Vogans’ missile can’t go without comment. 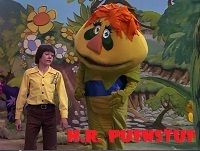 The same blasted clip gets reused the following season. They might have picked film of a rocket that didn’t say “United States” on the side. I’m particularly disappointed in the Cybermen’s leader. 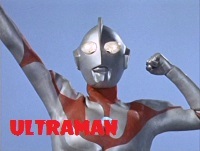 It’s not just that they all sound much more like humans talking through a funny voice-changer when they speak instead of the computerized buzz of the sixties Cybermen, it’s that their leader acts like a human. 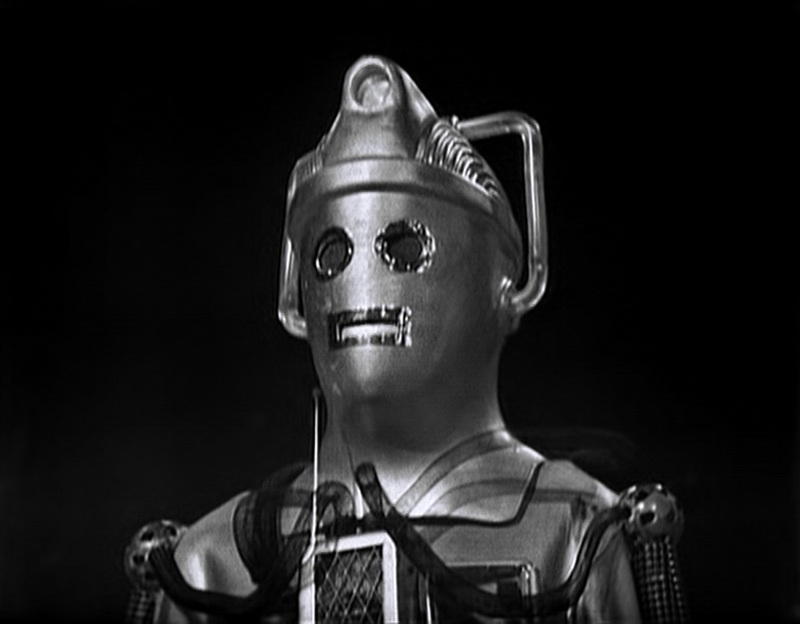 Maybe Robert Holmes meant to explain that the leader actually still has some emotions in him and ran out of space and time, but the other Cybermen speak simply and logically, and the leader speaks like a cartoon supervillain, and uses words like “excellent” when he hears good news, keeps his hands on his hips, and finds a thesaurus of extra verbs to describe how Voga will be destroyed, vaporized, etc. The dude needed about a quarter as many lines as he has. 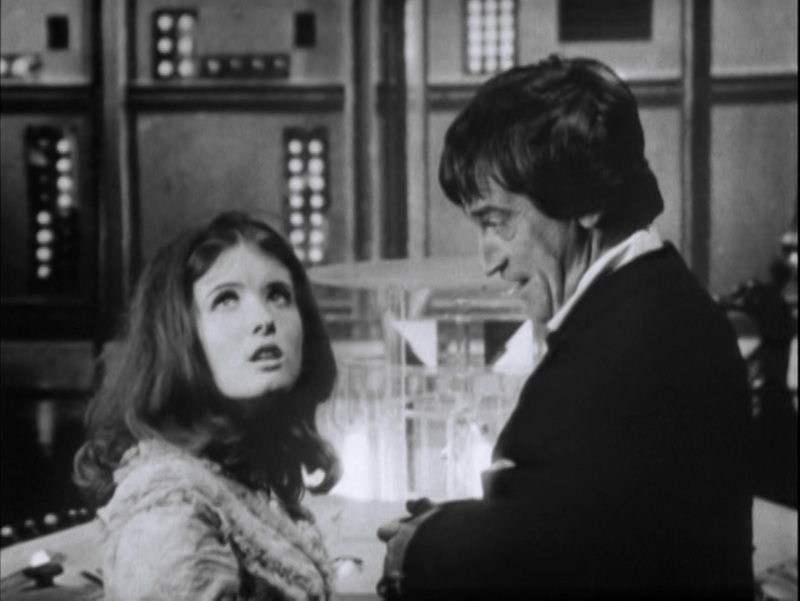 Producer Philip Hinchcliffe would only do one more story with a returning villain, and the next producer, Graham Williams, would only bring back two across three years. With the show looking forward more than it had in a long time, there wasn’t room in the series for the Cybermen, and they wouldn’t be seen again for seven years. Unfortunately, this story seems to have served as the template for their appearances in the 1980s, with Cyberleaders emoting too much and saying “excellent,” and everybody worried about gold. One final note: “Revenge of the Cybermen” was the first story that the BBC issued on home video, in an insanely overpriced 50-minute compilation. Well, everything on VHS was insanely overpriced, but £39.95 for a tape with half the story edited out really was ridiculous. With that in mind, the DVD is the perfect place for a completely wonderful documentary feature called “Cheques, Lies and Videotape,” which looks at the world of bootleg and pirate Doctor Who tape trading in the late 1970s and early 1980s, and the wild lengths that fans in the UK had to go to collect episodes of the series. Of course, at the time of writing, the Region 1 DVD of “Revenge” is out of print and Amazon wants $123 for a copy, so some things never change. It’s still better than the £300 one of the fans in the documentary paid for a washed-out nth generation copy of “Doctor Who and the Silurians,” though! We’ll take a short break from Doctor Who to watch something else, but stay tuned! Season thirteen begins next month! Our son is very, very clear that he doesn’t enjoy this story at all. We recapped the adventures in season twelve tonight, and he’s found something to like about every one of them, especially “Robot” and “Genesis.” Sadly, in a sign of future smart-aleckness to come, the thing that he liked most about “The Sontaran Experiment” was that it was only two episodes long, ba-dum-tish. “Revenge,” however, is very scary for him. This is another case where the villains absolutely have the upper hand. He doesn’t like how they’ve been physically violent toward the Doctor, and he doesn’t like how powerless everyone seems to be. He did enjoy the very good gunfight between the Cybermen and one faction of Vogans, but he absolutely hated the cliffhanger, where a rockfall kills Jeremy Wilkin’s character and knocks the Doctor unconscious. 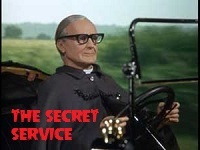 The episode ends with Harry, who isn’t aware that the Doctor’s got explosives strapped to him, trying to unlatch a buckle that will blow up and kill them all. No, our kid can’t wait for this nightmare to be over. But I love how well he’s paying attention! 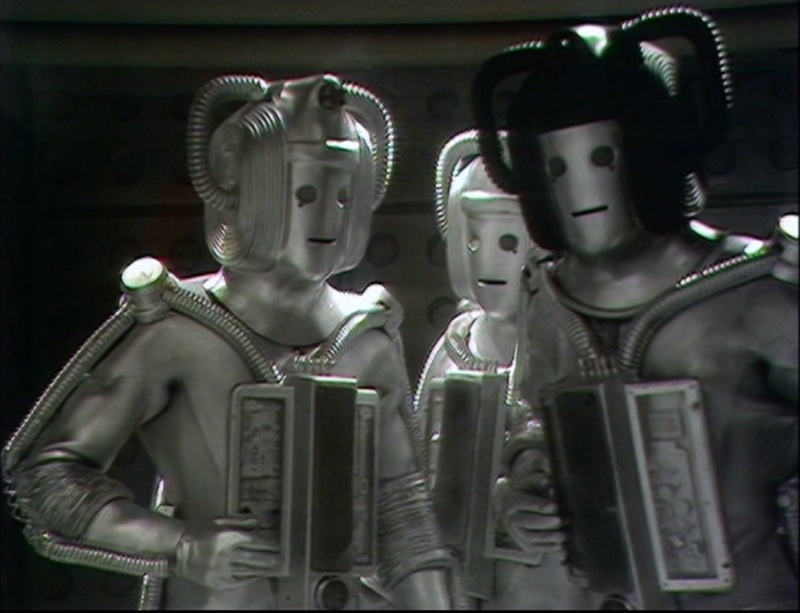 We know that his mind wanders during talky bits, but this time, as the Cybermen explain that they want to destroy Voga because “glitter guns” that used the planet’s gold routed them during their last military campaign, he was watching closely. 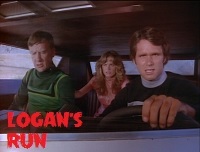 Later on, as the Vogans get mowed down, he asked why they don’t use glitter guns. That’s a pretty good question, really. 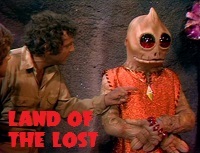 Speaking of the Vogans, this serial is just packed with recognizable actors, which kind of makes it a shame that some of them are completely unrecognizable under those strange latex masks! The two lead Vogans, one of whom has worked a deal with the human traitor to lead the Cybermen into a trap, are played by Kevin Stoney and David Collings. 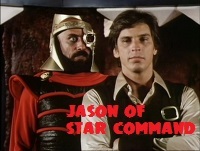 Another is played by Michael Wisher. 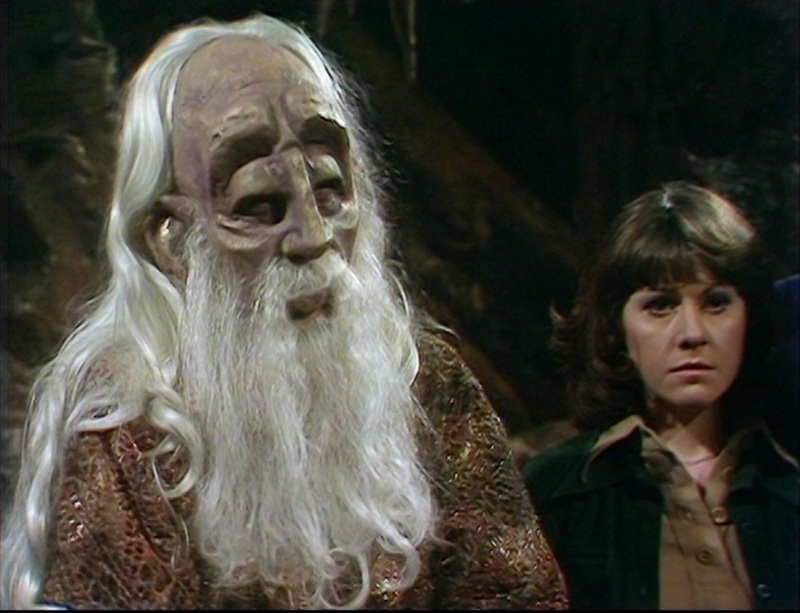 He’d been in the previous story as Davros and would be back two stories later without a latex mask. 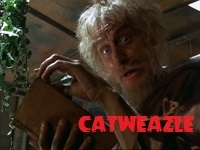 Wisher may be the only actor in Who to play three different speaking parts across four stories. And of course, among the humans, you’ve got William Marlowe, who we saw in “The Mind of Evil,” and Ronald Leigh-Hunt, who had been Col. Buchan in Freewheelers. 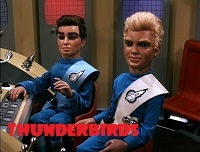 Jeremy Wilkin, who passed away in December, had a tiny part in Journey to the Far Side of the Sun and was the second voice of Virgil Tracy in Thunderbirds. 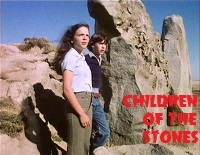 But the real surprise is that the music for this story is by Carey Blyton, the fellow who tried so hard to undermine and ruin the drama of “Doctor Who and the Silurians” and “Death to the Daleks” with his inappropriate horns and kazoos… and it’s not bad at all. It’s never intrusive and never undercuts the tension. It’s at least as good as the usual job by Dudley Simpson. So while it’s a shame that our son isn’t enjoying this story, I certainly am. Then again, I also know that part four’s going to let us down somewhat. I think he’ll enjoy some of the visuals of the climax more than the adults on the sofa will! Today’s post is one of more than a dozen in the Classic TV Villain Blogathon, and so with that in mind and several million new readers joining us, I should explain that here at Fire-Breathing Dimetrodon Time, my son and I watch popular, family-friendly adventure programs together. We’re usually joined by my wife and we enjoy looking at TV through the eyes of our favorite six year-old critic – when he’s not hiding behind the sofa or has his security blanket, “Bict,” in front of his face anyway – and sharing the experience with all you good readers. 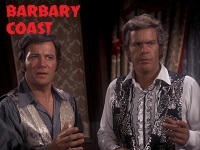 Our posts here tend to be on the short side, unless I’m in a long-winded and/or analytical mood and I feel like diving into the continuity or production of old programs, recognizing favorite character actors, or, like this one, digging up anecdotes from my youth and the first time I encountered a particular episode of a show. But we’re meant to be talking about the Cybermen today. At this point in our viewing of Doctor Who, we’re in April 1975, at the end of season twelve, and the Cybermen are making their first appearance in the show for almost five and a half years. They’re yesterday’s news, basically, and this very flawed but interesting serial treats them that way. 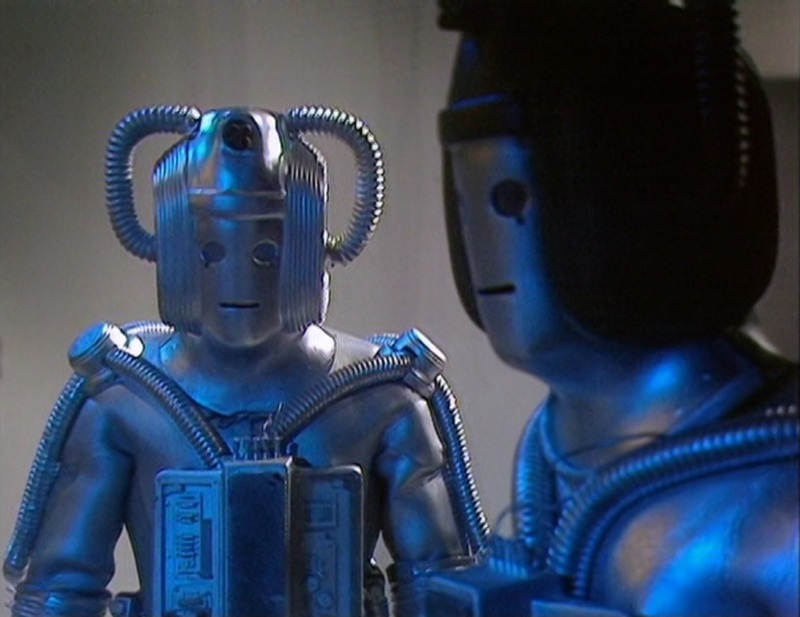 The Cybermen appeared in five stories over two years, and their principal motivation was to make other organic beings into machine-creatures like them. This was rarely addressed at length or lingered on in the original run of Who. 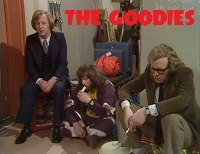 Some of their more recent appearances in the modern series have gone into more grisly detail about what this might mean, but an all-ages show in the 1960s was a lot tamer than one in the present day. 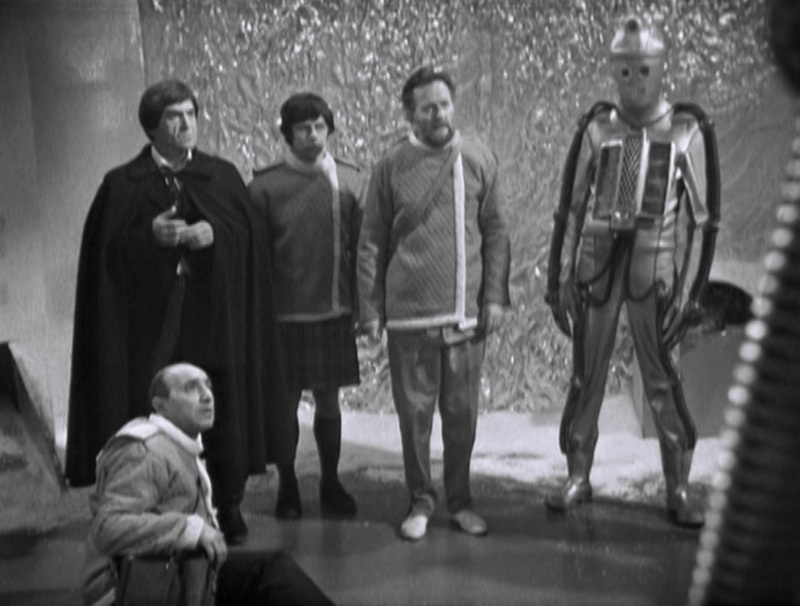 We watched 1967’s “The Moonbase” earlier this morning, and there’s an interesting bit where the Cybermen decide against taking the Doctor’s companion, Jamie, along for conversion because he’s injured his head and doesn’t have any value to them. HOBSON: You’re supposed to be so advanced, and here you are, taking your revenge like… like children! CYBERMAN: Revenge? What is that? CYBERMAN: Feeling. Feeling. Yes, we know of this weakness of yours. We are fortunate. We do not possess feelings. So it’s just typical of television that when the Cybermen showed up for the first – and only – time in the 1970s, it’s in a story called “Revenge of the Cybermen.” I reminded our son of this exchange before telling him the title of tonight’s adventure. He facepalmed. “Revenge” seems to be set in the early 30th Century, hundreds of years since the Cybermen’s last chronological appearance. 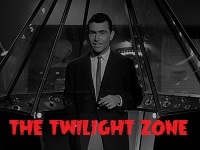 But, since this is a show about a time traveler, it gets to skip around, fill in gaps, contradict itself, rewrite history, or just screw up somehow. Sometime in those hundreds of years, there had been some massive Cyber-Wars, which ended very badly for the Cybermen. All that’s left of them are roaming bands of “pathetic tin soldiers skulking around the galaxy,” as we’ll hear in tomorrow’s episode. 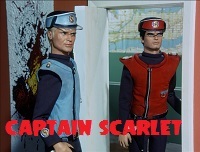 The script for this adventure is credited to Gerry Davis, but it was rewritten, massively, by Robert Holmes. 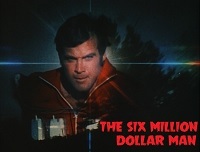 Davis’s original story had something to do with a space casino, but Miles & Wood’s relevant volume of their book series About Time is incorrect to say that this should suggest a connection between this and the Robert Urich detective series Vega$. 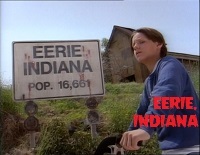 They write that Davis later went to America to “make” the series. 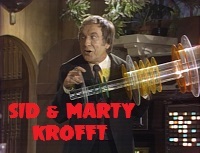 It was created by Michael Mann and Davis only wrote two episodes. 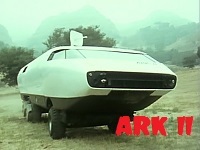 Anyway, it’s directed by Michael E. Briant, using many of the sets from “The Ark in Space” as a cost-saving measure. Last week, as we looked at “Genesis of the Daleks,” I explained how I first encountered Doctor Who in 1984 without access to a guidebook or anybody who’d ever even heard of the show. 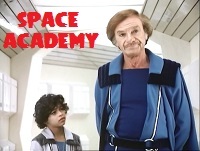 I’d missed “The Ark in Space” and made some assumptions about the series based on these two TV movies, almost all of which were completely wrong. Since the Doctor, Sarah, and Harry are traveling around this season via transmat and time ring, I didn’t see the TARDIS for a while and didn’t know what it was when I did. I thought this set – the Ark / Nerva Beacon – was where our heroes lived. The dialogue in this story explains that they’re currently in the past of Nerva Beacon. So they didn’t build their spaceship, they moved into it later. Got it, I think. But here’s where I got very confused. 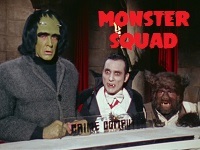 Because I was a comic book-obsessed kid, I assumed that every single villain that we met as this show went on were all part of the Doctor’s big rogue’s gallery. And since I’d seen that listing in the Atlanta Journal-Constitution‘s TV Week for “The Five Doctors” which called it a 20th anniversary special, I knew there was a lot of continuity and backstory for me to catch up on… I just didn’t know where in the program I was. I reasoned that I must be kind of early on, because Sarah and Harry were played by actors in their twenties or so (I was assuming that Tom Baker, Elisabeth Sladen, and Ian Marter had starred in the show for all twenty years), but the Cybermen were old villains. How old, though… that didn’t make sense. The story implies they’ve gone back in time thousands of years to have this adventure, and these Cybermen are clearly on their last legs… if Doctor Who has to keep going back in time thousands of years to fight the Cybermen, they can’t pose that much of a threat to his “present,” and his spaceship home, can they? Fortunately, our son was nowhere as confused, but he wasn’t all that happy about this adventure either. We started this serial tonight with its first two episodes, and he gave it a thumbs mostly down. The problem is that there are three rival factions ready to gun everybody else down: the Cybermen and two groups of Vogans. He seems to have a point. Even in a series where our heroes are constantly jumping from danger to danger, the Vogans are trigger-happy and don’t feel like sharing plans with any outsider. Their ranks are packed with good actors – more about them next time – but all he sees are a gang of threats with machine guns. On top of that, one of the human characters is a traitor, and he seems to be working for both the Cybermen and one of the Vogan groups at the same time. Throw in a nasty Cybermat, a metallic snake-slug thing that injects alien poison into your body, and this is just an intense experience for a young viewer. Maybe we’ll clear up some of the questions when we start part three Sunday evening! 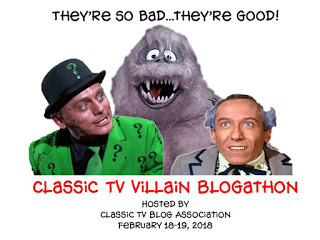 This post is part of the Classic TV Villain Blogathon hosted by the Classic TV Blog Association. To read all the fabulous posts in this blogathon, click here. I don’t know that anybody, anywhere, is really satisfied with the conclusion of “The Tomb of the Cybermen,” except for five year-olds. Ours thought this was really thrilling, and was very excited by these Cybermen being refrozen and sealed away, hopefully forever. Or until 1985, anyway. Otherwise, well, the “take that, you dummy!” moment where Toberman throws an empty costume across the room is one of Who‘s most painfully silly bits, but at least it’s over quickly. Eric Klieg wasn’t on anybody’s list of top hundred villains anyway, but his ranting this time is so, so boring. Honestly, I was having more fun watching my son curl up during the ominous bits, and hop around with a big smile during Toberman’s final fight with the Controller, than I was watching the program itself. 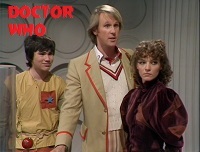 This won’t be the last time, though, that a promising Doctor Who story peters out in its final episode. It’s always bothered me that the heroes just leave Toberman’s body in front of the tomb doors like that. I prefer to think that they cut a line for time, and Professor Parry and Captain Hopper bring a stretcher party back for him. That’s a very unhappy moment. Our son had a little better time understanding the Cybermen’s voices in tonight’s episode, and really loved how exciting it was. He says that he wasn’t scared, but “when the Cybermen put those little things on the runway and they scared everybody” was a really “creepy” moment. Creepy and amazing are his two favorite adjectives. To be perfectly clear, though, he really would prefer voices that he can clearly understand! There’s a magical little moment just before the Cybermats – the “little things” that he described – attack. It’s one of the very few times in the series where the Doctor acknowledges having a family. There’s also a little bit of continuity that would get handwaved as the show continued, where the Leader recognizes the Doctor from the two previous Cyberman stories, and speaks about them as though they were the only two events in which the Cybermen were ever involved. The writers weren’t to know that they’d still be doing Cyberman adventures set all across time and space for the next fifty years, so the charming attempt to link the three stories in one linear and complete timeline simply can’t stand in the face of future fiction. 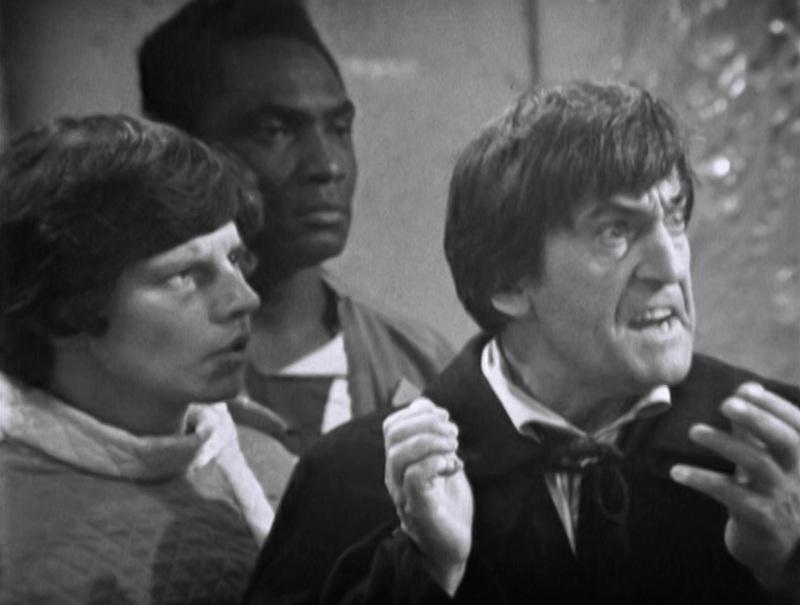 It’s one of the all-time great cliffhangers: the Cybermen have been awakened, and the foolish, villainous Eric Klieg is yelling at their leader, ranting about how they will obey him, and the leader grabs him by the arm and shoves him to the ground. Then, in a dispassionate electronic buzz, the leader says “YOU BELONG TO UZZZZ. YOU ZHALL BE LIKE UZZZZ.” It’s a brilliant moment. And yes, that’s right, Columbus GA. A Cyberman was working in the very city where Patrick Troughton died. I forgot to mention yesterday that “The Tomb of the Cybermen” is the first of four Doctor Who stories to feature Cyril Shaps in a guest role. 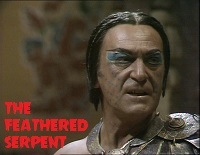 Shaps appeared in so many shows that I enjoy, like The Sweeney, Spyder’s Web, Department S, and The Saint. I really like how his character is constantly on the edge of total meltdown while his boss, Professor Parry, is so laid back and relaxed about their situation. They make a great double-act, and it’s a shame that Klieg guns him down. We had the animated “Power of the Daleks” as an appetizer, and tonight we introduced our son to proper, live-action Doctor Who with the first story of season five. We’re not quite done with animated fill-ins – there are four more cartoon episodes to come – and there’s a one-off telesnap reconstruction ahead of us as well, but it looks like this first episode went over very well. Our son’s favorite moment in the episode was when a member of the archaeological dig electrocutes himself grabbing the doors to the Cybermen’s tomb. That’s a bit grisly. You’d like to think he was most taken with the Doctor being witty or funny, or the creepy exploration of the rooms on the entrance level of the entombed “city” – it’s really more of a “complex,” isn’t it? – but no, he went for the shocking death. Hmmm. 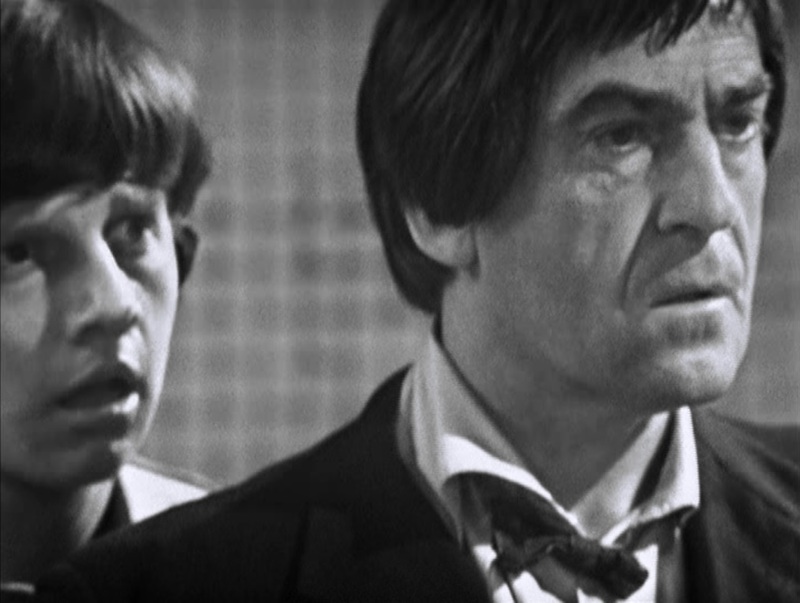 So, a few changes to note since “Power.” The companions in season five are Jamie McCrimmon and Victoria Waterfield, played by Frazer Hines and Deborah Watling. 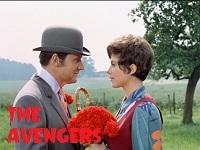 The story is by Gerry Davis, who had been script editor for most of seasons three and four, and Kit Pedler, a scientist, sci-fi author, and futurist. 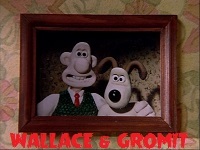 This was first shown in September 1967. Two and a half years later, Davis and Pedler would devise and write many episodes of a really interesting SF series called Doomwatch. 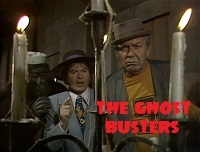 Season five has some interesting behind-the-scenes flux across its seven serials. 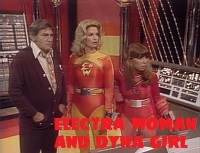 Peter Bryant produced this serial, Innes Lloyd (who had produced all of the previous season) the next three, and Bryant the final three. 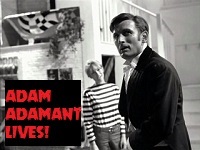 Bryant acted as script editor for Lloyd’s three serials, so he was deeply involved in all seven stories. 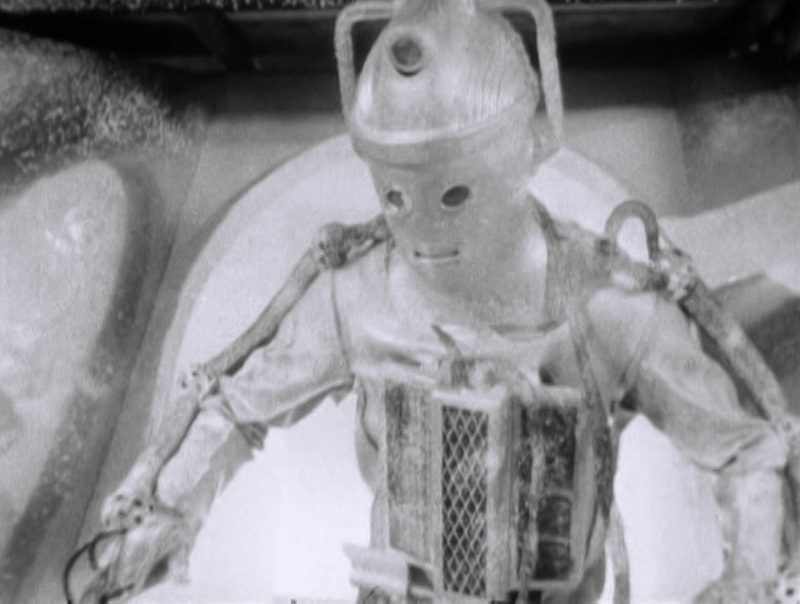 “The Tomb of the Cybermen” was one of the many Doctor Who serials destroyed by the BBC. 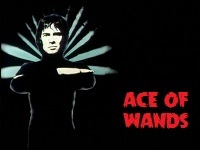 A complete set of films was returned from Hong Kong in 1991 and released on VHS a few months later. I bought the first edition DVD shortly after it was released in 2002. It got a major quality restoration for a special edition in 2012. I’m actually kind of kicking myself for not picking up that version before sitting down to watch it again. Well, maybe I’ll find an inexpensive copy one day and upgrade. 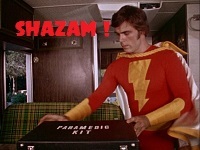 More tomorrow, including that cliffhanger.